Great idea on paper but a totally failed product as far as I am concerned. 2 independent footswithable distortion channels, with Contour switch for each and full eq (Bass, Mids, High) gain and overall setting. The switching is true bypass. Power supply (18 volt) included. Upon arrival I unpacked the unit and I noticed its weight. This thing is built like a tank and could possibly survive quite a few years of road abuse. The included power supply (18v) seemed strange at first but it makes sense - you're running 2 distortions at 9v each, so it needs twice the power. Good idea but replacing this down the road will be a huge hassle if it breaks down somewhere in the middle of say your US tour. Also there is no battery backup for this thing so those of you that want to run this while in outside of the US - tough luck! Now on to the testing - I grabbed two guitars, one a cheap Dean Z with pickup upgrade (Joe Satriani PAF) and the other being a mid stock Ibanez with Seymour Duncan Distortion pickup. I then lined up some amps to test it with - Fender Princeton 112 (clean amp), Marshall VS100 Valvestate head and a tube mid-80s Laney. The distortion pedal displayed pretty much the same characteristics on all of these amps. Channel 1 is more of a traditional blues, rock to metal distortion, the contour switch turns it into thrash metal/death metal distortion with tones reminiscent of mid career Metallica but lacking the definition. This is the more useful of the two channels but yet it seemed like it was lacking something, the sound was more like a cheap solid state amp distortion. By varying the gain from low to high I was able to get some convincing blues sounds out of this channel (with contour disengaged) but still nothing to write home about. Channel 2 can go from blues to fuzz and techno type of overdrive which to me sounded like total mud. In my opinion the voicing on this channel was a total engineer's mistake. There was no way I could coax even a semi-useful distortion sound out on this channel. The countour switch doesn't help matters much either - just provides a mid range dip. 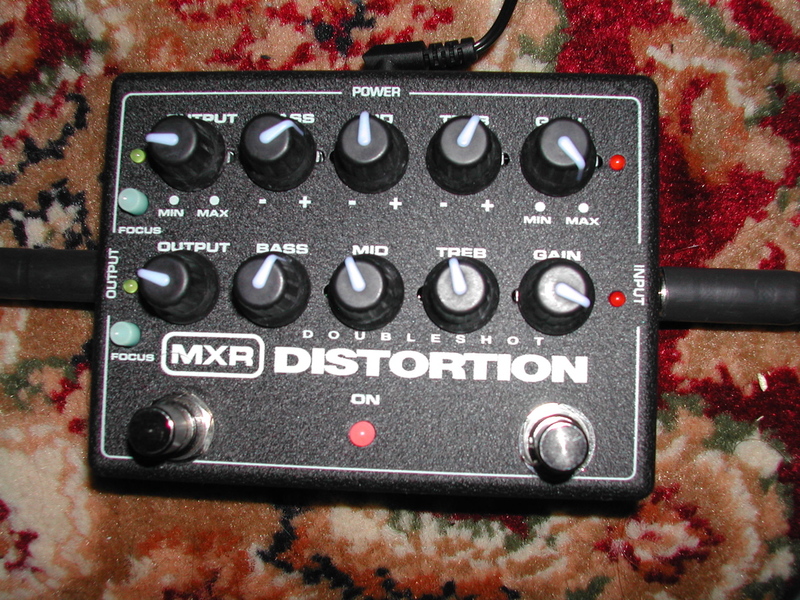 While this is a totally useless distortion sound for me I can see where some players might be interested in providing a totally crapped-out tone which is found in the work of some of some techno metal bands, like Nine Inch Nails for example. Again rolling on the gain the distortion clears out and you have a somewhat useful semi-distorted blues sound. A little better than Channel 1 on lower gain setting, but nothing really that great either. The eq knobs are very sensitive so little eq changes go a long way - something I really liked about this pedal. Still, with all this eq I wasn't able to get a quite convincing tone. I think MXR had a chance to create a really good product and they blew it. With the right distortion voicings this could be a great product but as far as I am concerned they missed on both channels. They could've taken some of their older overdrive and distortion designs and stuck it in this box, for example overdrive on one channel and a good distortion on the second would've gone a long way.